Statistical methods to more efficiently plot data when millions of points are present? I find R can take a long time to generate plots when millions of points are present - unsurprising given that points are plotted individually. Furthermore, such plots are often too cluttered and dense to be useful. Many of the points overlap and form a black mass and a lot of time is spent plotting more points into that mass. Are there any statistical alternatives to representing large $n$ data in a standard scatterplot? I have considered a density plot, but what other alternatives are there? This is a hard task with no ready solutions (this is of course because density plot is so a tempting fallback than no one really cares). So, what can you do? If they really overlap (i.e. have exactly the same X & Y coordinates) and you are not using alpha, the best idea would be just to reduce the overlap using unique (with alpha, it may be summed over such groups). If not, you may manually round the coordinates to the nearest pixels and use the previous method (yet this is a dirty solution). Finally, you can make a density plot only to use it to subsample the points in the most dense areas. This on the other hand will not make the exactly same plot and may introduce artifacts if not precisely tuned. the xy plane over the set (range(x), range(y)) is tessellated by a regular grid of hexagons. "I am not looking for a density plot (although those are often useful), I would want the same output as a simple plot call but much faster than millions of overplots if possible." It is also unclear what type of plot (function) you are looking for. Quick-R on "High Density Scatterplots"
Another direct answer to the question is the rgl package, which can plot millions of points using OpenGL. Also, specify a point size (e.g. 3) and zoom out to see these centers of masses as monolithic blocks, or zoom in and see the structure of what used to be monolithic - the point sizes are constant but the distances among them on the screen depend on the zooming. Alpha levels can also be used. Here's a file I call bigplotfix.R. If you source it, it will define a wrapper for plot.xy which "compresses" the plot data when it is very large. The wrapper does nothing if the input is small, but if the input is large then it breaks it into chunks and just plots the maximum and minimum x and y value for each chunk. Sourcing bigplotfix.R also rebinds graphics::plot.xy to point to the wrapper (sourcing multiple times is OK). Note that plot.xy is the "workhorse" function for the standard plotting methods like plot(), lines(), and points(). Thus you can continue to use these functions in your code with no modification, and your large plots will be automatically compressed. This is some example output. 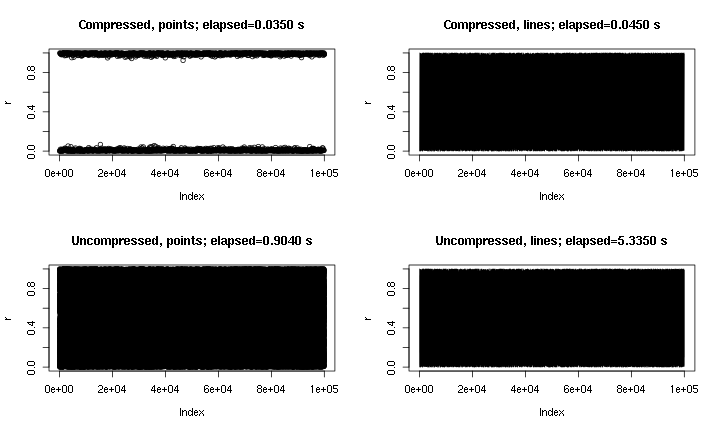 It's essentially plot(runif(1e5)), with points and lines, and with and without the "compression" implemented here. The "compressed points" plot misses the middle region due to the nature of the compression, but the "compressed lines" plot looks much closer to the uncompressed original. The times are for the png() device; for some reason points are much faster in the png device than in the X11 device, but the speed-ups in X11 are comparable (X11(type="cairo") was slower than X11(type="Xlib") in my experiments). The reason I wrote this is because I was tired of running plot() by accident on a large dataset (e.g. a WAV file). In such cases I would have to choose between waiting several minutes for the plot to finish, and terminating my R session with a signal (thereby losing my recent command history and variables). Now if I can remember to load this file before each session, I can actually get a useful plot in these cases. A little warning message indicates when the plot data has been "compressed". # things could get weird if they are out of order. # findInterval is much faster than cuts! Maybe I'll get shunned for my method, bad memories of one of my research profs screaming at people for throwing away good data by translating them into categories (of course, I do agree now a days lol), don't know. Anyway, if you're talking about a scatterplot, then I've had the same issues. Now, when I have numerical data, doesn't make much sense for me to categorize it for analysis. But visualizing is a different story. What I have found that works best for me is to first (1) break your independent variable into groups using the cut function. You can play around with the number of groups, and then (2) just simply plotting the DV against the cut version of the IV. R will generate box plots instead of that disgusting scatter plot. I do recommend removing the outliers form the plot (use the outline=FALSE option in the plot command). Again, I would NEVER waste perfectly good numerical data by categorizing and then analyzing. Too many issues doing that. Although I know that's a touchy subject of debate. But doing that specifically for the goal of at least making some visual sense out of the data, not much harm I've seen from it. I've plotted data as large as 10M and still managed to make sense out of it from this method. Hope that helps! Best Regards! Not the answer you're looking for? Browse other questions tagged r data-visualization or ask your own question. How to do a pretty scatter plot in R? Preferred methods for graphing time-series data to present “averages”? How to present statistical significance results among more than two datasets? How to plot data points over a map? Interpreting fitted vs residual plots for binomial general linear mixed effect models?